Check out our two weeks of fun during the school winter break. First week is dedicated to "Art and Play" camp and second week is "Engineering camp"! The goal of this camp is to help children improve critical thinking and problem-solving skills. Each program is designed to offer an exciting, HANDS-ON experience that encourages collaboration and teamwork among kids. 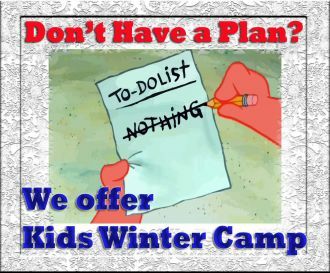 For more information and all details please check our website/ winter camp.